New from Merrick are the Backcountry ancestral canine diets. These dry dog food recipes combine a protein-rich kibble with freeze-dried real meat pieces. The combination delivers the nutritional benefits of a raw diet in a convenient recipe that is safe and easy to use. The addition of freeze-dried foods are becoming more and more popular as of late and they are a great way for sneaking in more healthy elements to your pets diet. We have a few freeze-dried options from other companies that are encouraged to be used as treats and/or meal mixers, but Merrick is the first one that is offering dried meats as part of their protein-rich kibble! 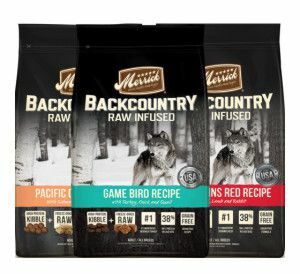 We are currently stocking all of the Merrick Backcountry dry canine recipes: Great Plains Red , Game Bird, Big Game, Pacific Catch, and Puppy.